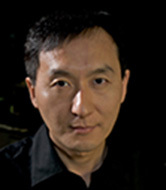 Chunlei Guo received his BS degree in physics from Changchun Institute of Optics and Fine Mechanics in China in 1994, and PhD in physics from University of Connecticut in 1999. Subsequently, he performed his postdoctoral research in Materials Sciences at Los Alamos National Laboratory. In 2001, he joined University of Rochester as an Assistant Professor. He is currently a Professor of Optics and Physics and an elected Fellow for both American Physical Society and Optical Society of America. He is an Editor for a number of journals in the field of Optics, including Light: Science & Applications and Optics Express. Professor Guo’s research is in the area of high-intensity femtosecond laser interactions with matter, including gas, solid, and plasma phases. His work at Rochester led to the discoveries of the so-called Black and Colored Metals, which may find a broad range of technological applications and have been covered extensively on his website: http://www.optics.rochester.edu/workgroups/guo/media.html. He has authored well over 100 refereed journal articles.